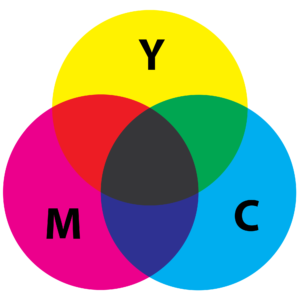 CMYK stands for Cyan, Magenta, Yellow and Key or Black which are the standard four inks used in colour printing. CMYK is also known as four-colour process colours. These inks when mixed together can form a variety of colours, depending of the percentages of the different inks used in CMYK printing. Pantone printing is colour specific and takes highly precise mixes of ink to create an exact colour. It uses pre-determined colours to “match” a certain colour used in the design process. Thus, it’s known as the Pantone Matching System. Pantone colours are also known as spot colours. The main difference between CMYK and Pantone printing is the level of accuracy. Pantone printing is highly consistent from job to job and from printer to printer. CMYK printing on the other hand is less consistent, therefore there can be slight variations in colour for CMYK prints. Pantone printing may be more precise, sharp and consistent, however it tends to be more costly than CMYK printing.